One of the best ways to prepare for an upcoming flight is a relaxing and rejuvenating yoga sequence. Airports have taken on to the trend, with some airports, like the San Francisco airport, incorporating yoga rooms into their design layouts. Passengers are embracing the healing benefits of yoga, with these rooms often being full before and after flights. Focusing on certain postures, intentions, and muscle groups will help you prepare for your flight, be more comfortable while traveling, and benefit your well-being. Doing the appropriate stretches before your flight can help you calm down and work on the body muscles that might be affected the most while you’re on a plane. When you’re flying through the air at hundreds of miles an hour, taking time for yourself beforehand gives you the right frame of mind for travel. Practicing asana benefits the mind, body and spirit. It allows you to nurture your body and develop self-control prior to the flight. Along with this suggested yoga sequence, try to embrace the principles of yoga during your flight. Even though you might be anxious, don’t drink any alcohol. Stay sober and awake, and stay hydrated with water. Try to take everything in stride and stay calm. Having a sense of humor can help during travel and makes you a great travel companion as well. These yoga practices prepare you for air travel. Pranayama to begin with is a centering and restorative practice that is the foundation for all postures and movements. The word pranayama means control of the life force or breath. The general philosophy of pranayama is conscious control of the breath and consequently the life force. There are a few different methods of pranayama. One of the most common breath control practices is alternate nostril breathing. This practice is known as nadi shodhana, and it is an excellent way to improve focus, clear the airways and helps to balance the hemispheres of the body and the brain. There are many benefits to practicing nadi shodhana and other types of pranayama. You begin by quieting the mind and sitting in a meditation pose. You then close one nostril and inhale through the other one. You use your thumb to close the nostril you inhaled from and exhale through the other nostril. Then, inhale through the nostril you exhaled out of and repeat the practice. Take full deep breaths, and breath with an easy pace. You can breath with 5 to 10 cycles or longer if you feel like it. Many yogis will begin their day with this practice to gain clarity and stay centered and imbues fresh air in your lungs prior to flight. Before you ascend thousands of feet into the air, taking a few moment to ground will help ease the tension and nervousness that is associated with air travel. Grounding is an easy practice that takes the energy in the upper chakras and limbs and moves it to connect with the Earth. The Earth is our fundamental connection in this universe, and establishing a solid connection with it prior to boarding a plane moves the energy in a healthy way and can also make traveling go much smoother. When you approach traveling from a grounded point of view, things flow better and you might even notice that other people are more accommodating or helpful. Having a clear head and knowing your place in this world gives you strength, confidence and courage that is really useful when you’re around new people and seeing new things. This simple routine is a basic stretching exercise that will help you to stay centered and grounded through yoga. Begin the practice seated on a yoga mat or blanket. For your first move, stretch your left leg out to the side. Feel the stretch through the leg and muscles, and if you’re feeling comfortable you can reach out and touch your toes with one hand or both hands. Another way to deepen the stretch is by placing your head on your knee. Now, you can either bring that leg in and stretch out your right leg, or stretch your right leg out as well. Do the same thing with touching the toes or your forehead to your knee. Now, after stretching your legs, bring yourself to center. Stretch your hands out and feel the stretch in your body and spine, letting the ground balance you and give you strength. After this stretch, lay on your left side. Take your right leg up and hold it with your hands into Visnu pose. Know that you are strong and powerful. Hold this pose for a few seconds, and then alternate to the other side. Sit up and stretch your legs out in front of you in staff pose. Feel how your spine is the foundation of your body and stretch in this pose that will stabilize you. From staff pose, take your left foot up in your lap and hold it in pulling the arrow pose. Set your intention for a safe flight and happy travels in this position. Do the same thing when you alternate to the other foot. Choose any other grounding poses that you feel comfortable with, and this series is a good starting point. Working with your legs and core is important to staying healthy and to get ready for flying. One basic pose that is strengthening is triangle pose. Hold this pose for two minutes on both sides and imagine you taking off in the air as you stretch it in the air. Another great pose to work on the legs is Warrior 1 pose, which also strengthens the core and the arms. Working on the legs is important so that you stay nice and limber during your flight, where you will be seated the whole time. Working out your legs before a flight is important because they will be kept still during the flight, but you will want to be nice and limber when you land. When you are getting your bags and exploring a new city you definitely want to avoid leg cramps. Stretching your legs before you fly will help you to be more comfortable while you’re in the air, seated, and exiting the plane. Another great practice before you travel is to work on your back. Your spine is the foundation of your body and the seats that you use can sometimes be confining. A basic back stretch you can work through is the upward fold. Start by standing, and then bend forward by touching your fingers your toes or to the ground. The next progression would be to step back into downward facing dog, which also will stretch your hamstrings. You can raise one leg for more stretching and strength building. From there, work through cat and cow to improve blood flow and stretch the muscles and spine. You can then get on the ground and practice simple back stretches. One that lengthens the spine is to lay on your stomach and point ahead with your hands interlaced and your index finger stretched ahead. Locust pose is another strengthening pose for your back before you fly. While you’re waiting in the airport, you can do simple spinal twists or spinal rolls that work to strengthen the back and spine. Doing simple arm stretches and rolling your shoulders or neck also helps improve your flexibility and the condition of your back. 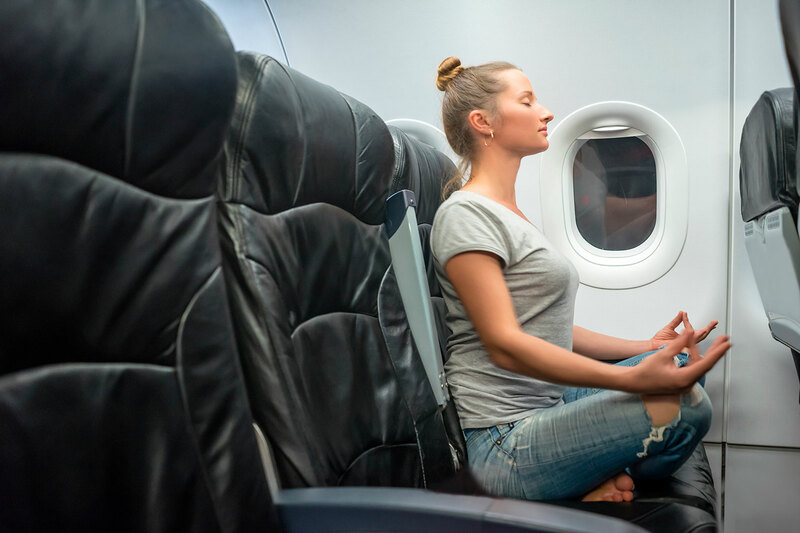 You can physically perform heart openers, and you can also perform meditations and gratitude that will help you acknowledge your connection to your travel companions and improve your flight. While working through your heart opener poses, you can meditate on gratitude for the crew for their hard work and expertise. You can include the people checking your bags, cleaning the bathroom, serving drinks and packing your luggage as well as your friends or family that you are traveling with. Simply thinking about how amazing it is to be able to fly almost anywhere in the world in a matter of hours is a great heart opening practice that you can work through. One heart opener pose is camel pose. Hold this for thirty seconds. From camel pose, you can choose another chest opening pose. Cobra pose opens the chest, strengthens the legs, and stretches the back. Hold cobra pose for another thirty seconds. From cobra, lay down and work on your bridge pose. While holding bridge you can think about your journey as a bridge from one geographical location to another. You can meditate on the reasons of your travels and set intentions for the types of relationships or journey that you would like to accomplish. Bring your hands to center in a heart mudra pose and from there you can be ready to “take off”. Warrior III is an awesome pose that helps establish balance and lets you be able to stimulate flight with the action of your hands. Visualize yourself flying for a fun way to prepare for you flight. You can end the practice with mountain pose to emphasize strength. Finish the series with any pose that you see fit, including corpse pose or tree pose. When you’re getting ready to take off, preparing your mind and body with yoga will help you to stay present in the moment while traveling and feeling physically and emotionally ready for everything that traveling can bring to you. This simple series will help you ground, stretch important muscle groups, and help remind you of how fun traveling can be.